The conference will be held at Instituto Superior Técnico (IST). The sessions will take place in two separate buildings: Torre Norte (the North Tower building) and Complexo Interdisciplinar. In the diagram below, the former is identified as 1 whilst the latter is designated by 2. Specifically, we will be in rooms EA2, EA3, EA4 or in the auditorium Abreu Faro. 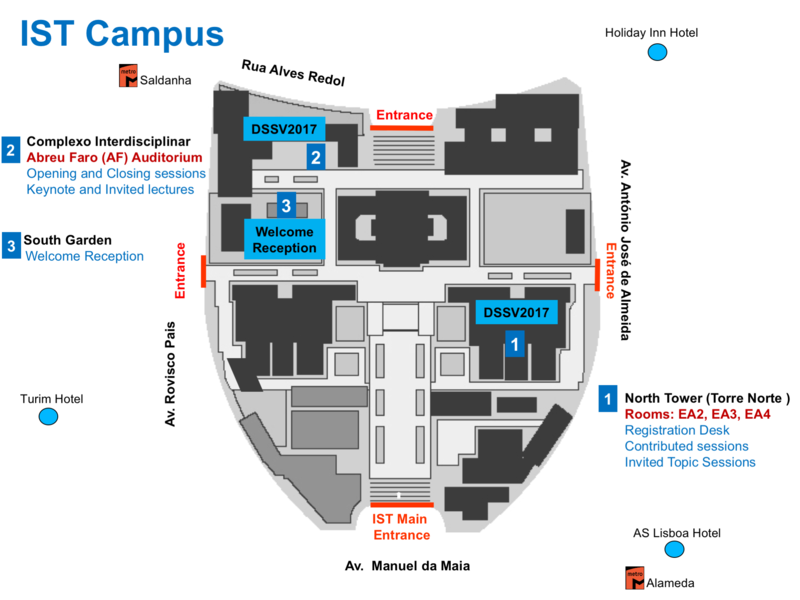 The diagram is meant to remind you that EA2, EA3 and EA4 are on the Torre Norte (1), whereas the auditorium Abreu Faro is placed on the ground floor of Complexo Interdisciplinar (2) (at the entrance, turn right). Google maps describes the indoor geography of Instituto Superior Técnico automatically. All you need is the app itself. Click here to provide you the location of Torre Norte and Complexo Interdisciplinar. The auditorium is not recognized by Google Maps, but you will not miss it.